In this interview Sean Usher talks to Pete Hillier a Director of Eco Fires and Stoves about Stone Fireplaces. Sean: Hello this is Sean Usher. In this Podcast I am talking to Pete Hillier a Director of Eco Fires and Stoves about stone fireplaces. In particular Portuguese Limestone, Bath Stone, Slate and Granite. First of all Pete, tell us about the bespoke design services that you offer? Sean: So do you start with someone choosing the Gas fire or woodburner? Pete: No Basically what we have is a showroom, in that showroom our packages that we know work together so what happens is, I will initially take a fire design one that we particularly like, might be a new model or a more traditional model that's been out for a while. And I will look at that appliance and try to come up with something that works well with it. So whether that's the physical dimension, the shape or the door on the appliance, the height, whether it's modern or traditional, and I'll make something to suit it. And we'll set that up in the showroom as a package. Sean: Alright so take me through the actual design process. Pete: We'll get a fire in, okay; say it's a Gasco Gas fire which is a Glass fronted modern fire with a very realistic fuel bed. It's popular to start with then what we will do, we will take into account whether that fireplace looks right with that fire with the amount of stones surrounding it. So that's the first thing we look at. We then look at does that fire place look right with fire in it. Set at say a certain height within the fire place. Does it look good when your standing up and when you're sitting down which is quite important especially when it's in your house, in your room and you're looking at it all the time. Once we've done that, we've also to take into account what the fire requirements are. Sometimes there are controls, hidden controls in the fire that need covering with the panel of stone. It's important we get it right as far as that's concerned as well. So we got to take all these things into account. Then, there's the more technical side of it. Where the fire is put into this particular fire place. We need to make sure that the installation goes right as well in the majority of homes. It doesn't cause too many headaches where that's concerned. So there's quite a lot to go that goes into designing the fireplace it's not just about the look, it's about whether the whole thing works as a package as well. Sean: And this drawing that you put together, I believe you put a drawing, it's a bit of passion with you I know, it's not CAD design, is it? It's all hand-drawn. Pete: It's drawn in my mind to start with, it's where my passion for it comes into it because its the sort of thing I take home after my day's work and start thinking about this because I enjoy it so it starts off with a picture in my mind and then it's not something that comes as a computer package to help design I do everything by hand and I quite often use an eraser and a pencil to get it right in the end. So that's generally how it works for us. Sean: And how long have you been actually doing these hand-drawn designs? Pete: I have been doing it as a service for customers, for probably as long as I have been running the business now which is around 15 years but its becomes a real passion in the last sort of five years purely down to customer feedback and customers seem to like what we put together to start with. And then loved the service we give them after within their own home. So its become a passion because of that because of the feedback from the customers. Sean: Okay so let's actually talk about these surrounds and let's talk about first of all Portuguese limes now what are the main qualities of Portuguese limestone? Pete: Portuguese limestone is a generally light coloured stone with a slight veining which runs through it. It's actually quarried stone which comes from an area just north of Lisbon. And it's very popular because it's so neutral but it has got these slight veins which makes it very obviously a natural product when its put together so it doesn't look like a slab of concrete which some stones can end up looking like because they have got no features in them, It's also very smooth to the touch it doesn't have many crevices in it. And it doesn't have any heavy marks to it so it's a very popular stone for that. Sean: And is it hard wearing and permanent? Pete: It is hard wearing actually a lot of people think limestone always chips easy and what have you, yes like any other product like that it can chip. But because it's a natural stone it can be rubbed down very easily with fine wet and dry paper. It can be filled very easily if you ever get damage and you can't do that with many man-made products. They are not very good when it comes to repairs because they're not consistent in colour all the way through. Sean: Is it one of your favourite surrounds to work with? Pete: Portuguese limestone and there's another stone which we call Agean limestone that comes from a place called Antalya which is North of Turkey. That's also a really nice stone. It is less marked it is a whiter stone, tends to go with the more traditional fireplaces but it's very similar in the texture and the way it feels. And it's just as nice to work with because you can get some nice profiles on it. It's nice and easy to work with. Pete: Bath stone is different all together, bar stone is a much more traditional English material to use. We use a company called Wessex stone from Tetbury in Gloucester And that stone it's a mined stone, a locally mined stone and it's much more traditional rustic sort of feel it's got quite heavy veins running through or it can have but it's quite a creamy looking stone consistency. Sean: Okay tell us your opinion on slate and granite then please. Pete: Slate and granite is becoming more popular, one you can come and mix it with the lime stones to give a contrasting back panel and hearth. And a lot of people that go for wood burners also use slate and granite the darker colours much more because obviously there's less staining involved from the falling ash beneath appliances. But generally some people, I do use slate and granite a lot with my gas fires as well because you can create impressions with it because its a dark material against the light material, you can create for example a bigger looking opening than what people have to actually deal with. So you can give a slightly different look. It can give a modern twist it can give a more traditional twist so, yes. Sean: So you design these, hand draw them, I'm guessing you show it to the customer to see if they're happy with the design? Pete: Yes, a lot of customers they know what they've seen in the show room, and if I have to do some slight modifications they tend to trust me and just let me get on with it but I would always offer that service if they really wanted I would do them a hand sketch to see what the final product is going to look like. Sean: The fire places themselves I'm guessing they are not actually made at your showroom. Pete: No, no we work very closely with two main stone masons. One is County Stone they deal with the Portuguese, the Agean limestone the slates and the granites, County Stone are in a place called Walburton which is West Sussex. And they basically work really close with this, so when it comes to doing bespoke designs, we talk about it a lot before they manufacture it, they will sometimes make models up to make sure it all works and balances up correctly. And we have been working with them for a long time, so we can more or less do that in our sleep , no problem and here our company is Wessex stone in Tetbury which I have already mentioned. Sean: So how long does it actually it take to design and build a bespoke fireplace? Pete: if I've got to come back and design a specific fireplace design for a customer, I will spend probably two hours drawing it. And then once I'm happy with the drawing they go off to County Stone where they look at it and make sure that it all goes together with the types of stone we are using. I suppose the whole process the design process probably takes about four hours. The actual manufacturing process probably takes about week. Sean: Okay, alright now there aren't obviously a lot of different kinds of surrounds, what are your feelings on wood surrounds is it something you supply? Pete: Wood surrounds we do quite a few wood surrounds, they tend to be solid oak in different finishes, we use a company called Focus Fireplaces and they do a lot of bespoke design on wood. It's not a big part of our business because just the way it's gone with wood at the moment, it tends to come in and out probably every sort of five years we will get more wooden fireplaces and it will be like a 50/50mix but yes, at the moment it's a fairly small part of our business. 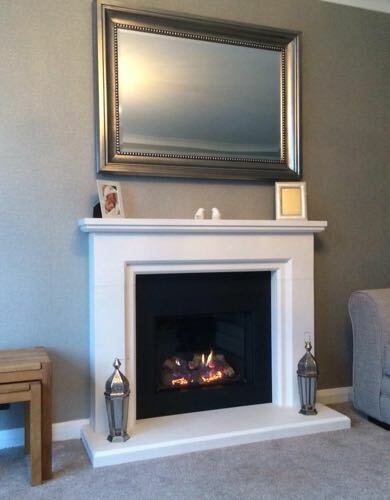 Sean: So if someone was considering having one of these fireplaces we talked about in Portuguese limestone, Bath Stone, what's the next move for them, call in and ask for you? Pete: Yes but basically people usually come into the showroom anyway and so we encourage people to come into the showroom even if it's they're first call is on the end of a phone, we always say come in and have a look at the materials. And generally we'll put somebody who will pick a certain design that they've seen in the showroom or sometimes they will come in with a particular design they want made. And then obviously at that point they decide what type of thing they would like and I'll always make a visit out to their homes so do a home survey. Sometimes I will actually change what they have been looking at and explain to them why and it's just all about making it work in their home rather than in our show room. And sometimes I will actually talk them completely out of what they have look at and show them something else that I think would be more suitable just to make sure that they have made the right choice.